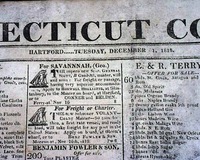 CONNECTICUT COURANT, Hartford, Dec. 1, 1818. 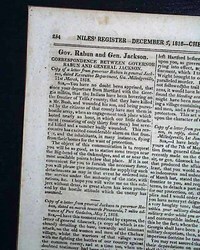 NILES' WEEKLY REGISTER, Baltimore, Dec. 5, 1818 Inside has nearly two pages concerning the Indian troubles in Georgia and the thoughts of Andrew Jackson on the situation. 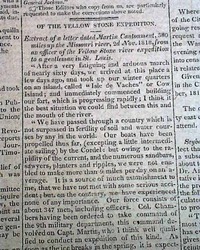 See the hyperlink for further details of the controversy, which includes text taken from one of Jackson's letters printed in this newspaper. 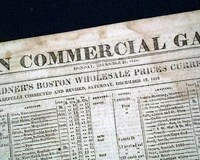 1818 Alexander Arbuthnot Court Martial..
NEW-ENGLAND PALLADIUM & COMMERCIAL ADVERTISER, Boston, Dec. 15, 1818 On the ftpg. 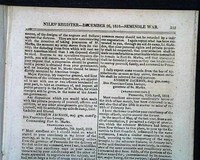 under "Arbuthnot" are the charges and specifications pertaining to Alexander Arbuthots court martial ordered by Andrew Jackson. Rubbing and some lite dirtiness does not affect this report.